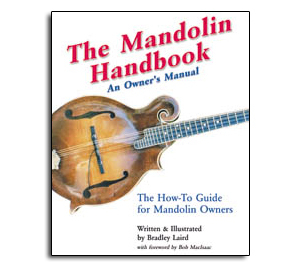 This handbook is designed to help you understand how mandolins are built, how they function, and what you can do yourself to take better care of your instrument and improve its sound. You will learn to make adjustments, select accessories, and many other things which will make you more conversant and knowledgeable about mandolins. You will learn how to keep your instrument protected from damage. You will learn ways to bring out the most from your mandolin and, with a deeper understanding and appreciation of the instrument, you will produce better and more fulfilling music. You will also learn about certain intricate tasks which wisely should be left to the most experienced experts. With an improved understanding of these topics, you will be in a better position to find qualified experts, judge their work, and have a greater appreciation for their skills. Includes mandolin history, care, setup, adjustment, tuning, accessories, repair...a complete guide for the mandolin player! 80 pages.